MailerMailer is giving out $250 for the best email marketing design created with their message creation tool, MessageMaker. 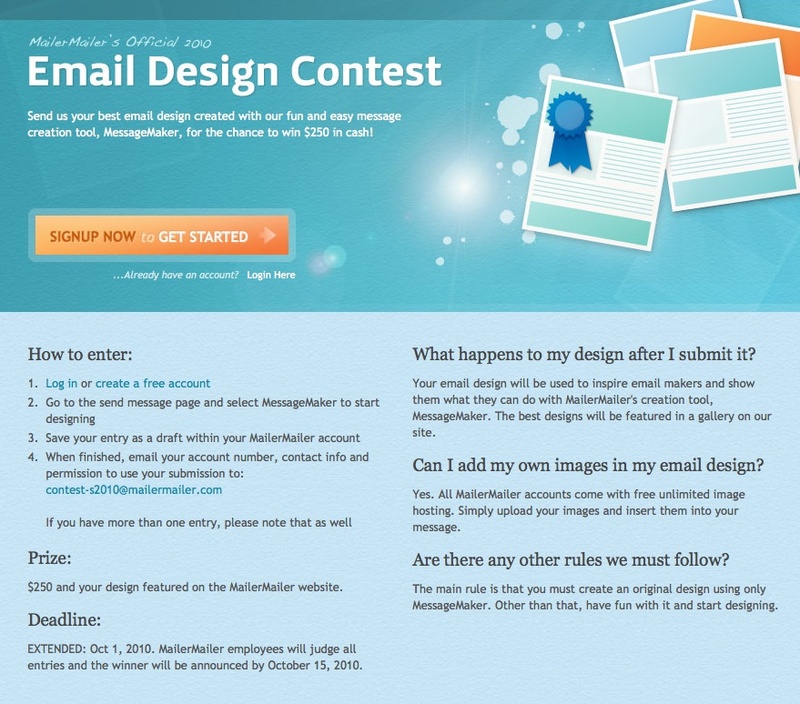 Email marketing service, MailerMailer, announces its fall email design contest. Users can enter their best email marketing design created using either the free or paid version of MailerMailer with the chance of winning $250 in cash. To enter, users must log into their account and create a visually appealing email using MessageMaker, MailerMailer's easy-to-use email marketing message creation tool. All submissions are due by October 15, 2010. All entries will be judged by MailerMailer employees and the winner will be announced by October 30, 2010. The grand prize winner will receive a $250 check and their design will be featured on the MailerMailer website. You can find more information and contest details at the email design contest page, http://www.mailermailer.com/email-design-contest.rwp. MailerMailer is a leading do-it-yourself email list management provider. Equipped with the latest email marketing technology, such as zip code radius targeting, image hosting, fetch HTML from website feature and an intuitive message editor, MailerMailer allows easy creation of professional email newsletters and campaigns. MailerMailer is part of a series of sites run by Khera Communications, which includes discussion group management tool, DiscussThis, and small business resource site, MoreBusiness.com. A free trial of this email marketing service is available at http://www.mailermailer.com. Email Design ContestEmail marketing service, MailerMailer, announces its fall email design contest. Users can enter their best email marketing design created using MailerMailer with the chance of winning $250 in cash.